Rubber duckies have taken it up a notch – this one has an indicator that let’s you know if the water is too hot! A little cushioning for the knees goes a long way. 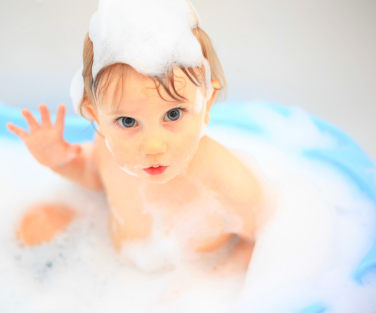 Aveeno Baby, Mustela and California Baby are top picks for toiletries. Stacking and squirting toys are fun and functional. A simple trick to keep baby warm: place an extra washcloth over their belly and pour warm water over it frequently. Get your (rubber) ducks in a row before the bath. Many moms recommend having the lotion, diaper, comb, and PJs all set up so there is less chaos following a bath. 1. Aveeno Baby Body Wash: It’s not expensive, and great for sensitive skin. 2. Carter’s Hooded Towels (and washcloths): These towels are easy to use, reasonably priced and get the job done. 3. PRIMO Eurobath: Great for small infants and when they get larger and can sit up. Plus it’s not heavy to move. 5. Kneeler: We had a great one that goes over the side of the tub and is non-slip. 6. Skip Hop Spout Cover: Now that my son is using the real tub, this is absolutely essential for safety. 7. BRICA Corner Bath Basket: This holds toys and really does hook on to the tile because the cups are movable to avoid seams. 8. Skip Hop Dunks Stacking Bath Toy: Just the right size, this set of three leaves one for me to use and at least one for my son to play with. Next story Big Qs: What do I do for a gassy baby? Previous story Big Qs: What do I need to give my baby a bath? Big Qs: What do I do for a gassy baby?